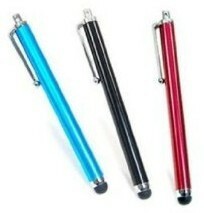 3 Capacitive Styluses for Phones, Tabs & More only $1.20 w/ Free Shipping! Wow, hurry over to Amazon to score 3 capacitive styluses for only $1.20 with free shipping! For being so cheap, these have really great reviews and seem to be good quality. They can be used on any device that has a capacitive screen, including tablets, smartphones, e-readers and more.